This is a college poster you can't look away from! Unfortunately, you have to try because you have a lot of studying and homework to do. That's how eye catching and amazing this dorm wall art item is! Your friends won't be able to look away from this gorgeous dorm essentials item. That makes it a perfect addition to dorm room decor. With the color and design in this college supplies item, your other dorm room decorations will blend fantastically and create a dorm room decor style that pops with gorgeous color and style. 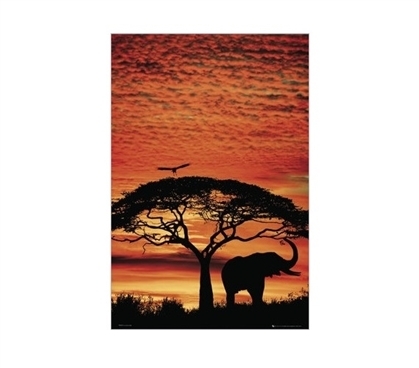 Make your college dorm room super comfortable with dorm wall art like our Africa Sunset College Poster! Our Africa Sunset Dorm Room Poster features a stunning sunset. In the foreground of this dorm necessities item is a shadowed tree, grass, elephant and bird. The shadowed design in this college supplies item looks absolutely amazing against the backdrop. The backdrop in this dorm essentials item features a deep orange and yellow sunset that pops with color. This cool poster for dorm rooms turns a basic cheap dorm supplies product into dorm wall art. Your dorm room decorations will be completed with this gorgeous dorm essentials item in your college wall decor.